The word ‘chakra’ is derived from the sanskrit word meaning ‘wheel’. Literally translated from the Hindi it means ‘Wheel of spinning Energy’. A chakra is like a whirling, vortex like, powerhouse of energy. Within our bodies you have seven of these major energy centres and many more minor ones. They regulate the flow of energy throughout the electrical network (meridians) that runs through the physical body. The body’s electrical system resembles the wiring in a house. It allows electrical current to be sent to every part, and is ready for use when needed. Sometimes chakras become blocked because of stress, emotional or physical problems. If the body’s ‘energy system’ can not flow freely it is likely that problems will occur. The consequence of irregular energy flow may result in physical illness and discomfort or a sense of being mentally and emotionally out of balance. There are also 7 energy points which can be seen as the antennae of the radio. Each Chakra represents a level of consciousness, a specific frequency in this ocean of energy. So the chakras are not physical, they are aspects of consciousness, in the same was as aura’s are. There are many energy wheels, points, chakras in the body, we have primary and secondary chakras, here, we will discuss the primary once that are most relevant for the yogic point of view. The chakra’s are rooted in sushumna nadi & interact with the physical body. So we can’t see them, but we can feel them. Think about having butterflies in your stomach, or the feeling that your heart is broken, or when you have a blockage in your throat that you feel like you can’t talk. This are ways to get in touch with your chakras, to bring awareness to those feelings. In india, the chakra’s are represented and illustrated as lotus flowers. The lotus flower is growing up from the mud into a beautiful flower. Representing the transformation from a primitive consciousness to an awakened soul. Like lotus flowers, chakra’s can open and close. ‘ someone who is talking all the time, not giving space and time to let someone else talk is an indication that vishuddha chakra is too open. When we do asana practise, the asanas resonate with specific chakras, For example when we do Cobra, this is an heart opener. To open a chakra, web ring energy ti a specific point which we can do with our minds, in meditation & through asana practise: where the mind goes, energy flows. Support Centrum of the human Being. Foundation of the human being. Concerned with self-preservation, security & survival. For food & shelter, to ground themselves. – Losing wealth and material possessions. This Chakra is very active in the first years of a child. When it belongs to a family, depended on others because for survival of the child is dependent on it. Muladhara is also the base where 3 main subtle energy channels (Nadis) Emerge, Which one? (Ida, Pingala, Sushumna) KUNDALINI ENERGY. ‘ SVA’ means One’s own or Self. Adhistana means dwelling, resistance or seat. Literal translation: One owns dwelling. Referring to the fact that according to the yogic tradition this chakra is the storage place for the unconscious mind. – Also we can consider that this meaning speaks about the representation of the place where humans créate the feeling of individuality. This chakra associates with the drive off seeking personal pleasure, pleasure through food, drinks and sexuality. The concern at this level of consciousness is acquiring pleasurable sensations. At muladhara the level of consciousness is concerned with food and shelter to sustain the physical body, in svadhisthana this is for enjoyment. Location: Level of the Sacral, front side, public bone. Consciousness: Enjoyment of senses, sensuality, interconnectedness with the environment, desire to have a family and children, connect us with other beings through our emotional feelings. Being social is very important. Food & Shelter is being met so the human being wants to créate an environment that brings joy & pleasure. On this level of consciousness the human is like a HUNTER, of pleasurable senses so craving certain types of food and sexuality. City of the Jewels, referring to the intensity of the level of energy ‘ prana’ at this level of the body. As the sun radiates light & energy to the plantes, in the same way manipura radiates prana, throughout the whole being. So we often comare it with the sun, or blazing Fire. Manipura is where your digestive fire is, located at the level where the body also digest its food. Manipura is associated with the drive of seeking power, attention, social position and fame. When we compara manipura to the first two chakras the human being was very connected to belonging to a group, don’t want to miss out, at manipura the human is more individual, separated from others. The hum wants to express its own will to decide and choose for himself. – Losing: Power, Position, Fame, Respecto or being a loser. Sit comfortable, eyes closed, straight back. Breathe slowly and deeply, use abdominal breathing. Feel the expansión and contraction of the navel as you breathe in and out. Keep the attention on the level of the navel, than relax and witness the effects. Anahata means un-beaten or un-struck. Anahata is the un-stricken centre, referring to the cosmic unstruck sound AUM, which begins in the heart, being the seed of all sounds. The sound of creation. Anahata is the seat of Love, Harmony, Good tendencies, tolerance, balance and compassion. There is no attachment to security, worldly pleasures, honours of social status because the motivation here is LOVE. At this level is where one begins to accept, to understand and love people and the objects in the world for what they are because the perceptions arises beyond their differences, because everything is a creation, manifestation of the divine. UNCONDITIONAL LOVE. Aspects: love, Kindness, Empathy, Selflessness, Tolerance, Self-giving, Compassion. Inspires the human being to love, becomes aware of the capacity to love and receive love, free from anger, lust, jealousy, envy and so on. The purification center, because of its quality of purifying and harmonizing the opposites. At the level of vishuddha all concepts of good and bad fall away in the sense that they are seen in a higher light, from a wider perspective. This chakra gives the power to alchemize all the poison aspects of experiences and transform them into bliss. Yogananda: It doesn’t matter what happens to you, but what you do with what happens to you. Aspects: purity, intuition, creativity, harmony, desire for spiritual knowledge, calmness, universality, The seat of speech, giving voice to the emotion within the heart. Vishuddha gives the ability to see the essence, to understand the non-verbal messages, to understand the hidden messages in dreams. NO FEARS. The human being steps out from his individual consciousness and experiences his universal truth, having glimpse of cosmic consciousness. Freedom from the whirlpools of the world and the EGO. Ajna means command: The command centre. Represents the level of awareness and harmony where it is possible for direct mind to mind communication between two people. – the eye of intuition, because of the sharpness and clarity of perception that one gets once this chakra is awakened. – the third eye . the psychic eye that is located in the middle of the forehead, it is the eye that looks inwards. Location: The center of the brain, pineal gland, middle of the forehead, whole área. Aspects: control of command centre, the center of light, center of wisdom, center of paranormal powers. At this level the mind becomes a perfect instrument for self-revelation, it represents the level of awareness where one begins to realise the essence behind all visible things. Ability to understand cosmic knowledge and transmit it as scriptures. The witness consciousness is at this level. It is not really a chakra, but more a portal, a gate towards the oneness. Towards the bliss of Brahman. Therefore it has been translated as the lotus of a thousand petals. Sahasrara is beyond experience as it is the portal to samadhi, divine consciousness. Every description that we may give is an attempt to describe sahasrara. Only the words of enlightened masters can offer us a glimpse of what is happening when one reaches the level of consciousness. At the level of sahasrara any dualism between the subject and the object disappears. The Yogi enters the path of samadhi, divine ecstasy which will lead the yogi to a liberated being. Location: Top of the head, the Crown. Take the attention in the lower part of the spinal column. Try to display inside the color red. Inspire normally and expire slowly. Sit in the posture of the Illusion (Mayasana) legs crossed forward, the soles of the feet bent outward and cover each of the toes with the tip of your fingers, take the attention is always below the spine. Lie down on the back (Supta Virasana) put your hands on your thighs, and lower the eyelids. Take the attention in the coccyx, inside, try to display the color orange. Sit in the feet, elbows toward the floor, hands to the height of the heels lower eyelids. Squat down with the feet apart, put your elbows on the floor, the toes directed forward, the attention to the height of the navel, and interior. Kneel on the position of the Frog, lower the eyelids. Bring attention to the height of the heart, toward the center of the chest. Sit in the position of the fetus (Garbhasana) on the heels, elbows in the floor, the head on the floor or carpet, the eyes in the knees, attention is always at the center of the chest. Breathing 3-2-5-2 , breathe so during some moments. Lie down in the posture of the copper (Bhujangasana) Lower the pupils, take the attention in the throat center. Try to display inside the blue color. Sit in the position secret, hands placed on the knees. The eyes in convergent strabismus higher, look at the root where begins the nose. In the same position, move the eyes in convergent strabismus lower, look at the tip of the nose. Stay in the posture secret, bring your hands together toward the top of the head, lower the eyelids. Then the position of Shirshasana. Breathe freely. After this exercise we practice 3 or 4 times Bandha Traya, and then Shavasana, total relaxation. Welcome to the Sembrando Semillas Con Yoga blog! We are excited to connect with you in this new way and grow our community of yogis and healers. We also want to learn about you! Please feel free to email us with topics you’d like to read on the blog and how you want to engage with our program. Look out for our next post and get an insider’s look at one of our yoga teacher training programs in Pisac, Peru. YOGA TEACHER TRAINING YOGA 200 h.
We welcome you, with open hearts and with high enthusiasm to share with you the knowledge and wisdom of Yoga. Our intention is to show you how to become a yoga teacher, also you will be certified to teach by being eligible for Yoga Alliane registration after your graduation. Students learn techniques to re-arrange physical and mental disorder by perfect alignment, daily meditations, observation of the mind and the breath, body cleansing, and knowledge of our sublte anatomy like nadis and chakras. Cleansing and purifying the body and mind help the students to re-member their true Self, reconnecting with earth and the universe. 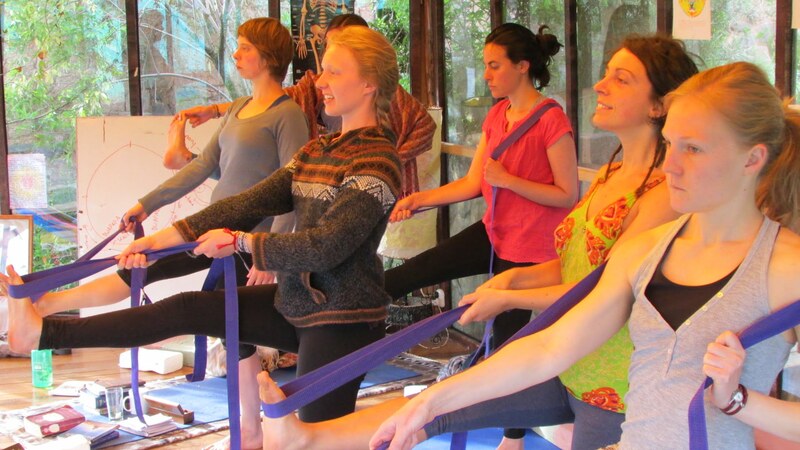 Most students are reborn through the practices and knowledge of what yoga really is. We teach with consciousness, our focus is on the ancient way of Yoga, as something medicinal. Our high responsibility, helping humanity.